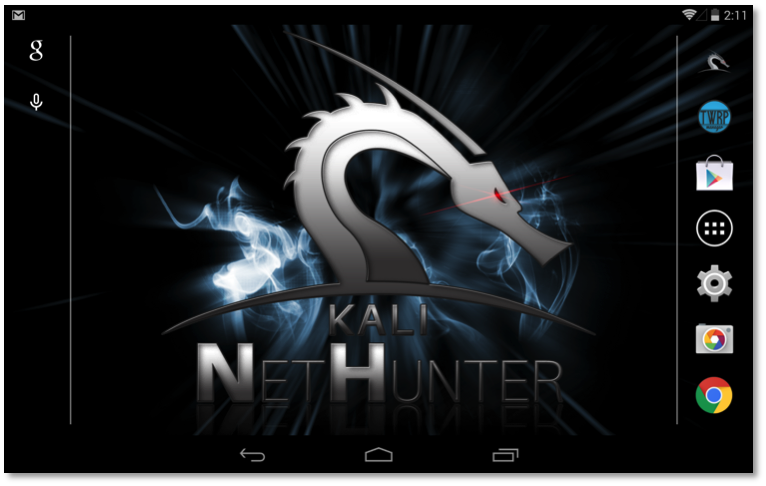 NetHunter is a Android penetration testing platform for Nexus and OnePlus devices built on top of Kali Linux, which includes some special and unique features. Of course, you have all the usual Kali tools in NetHunter as well as the ability to get a full VNC session from your phone to a graphical Kali chroot, however the strength of NetHunter does not end there. We’ve incorporated some amazing features into the NetHunter OS which are both powerful and unique. From pre-programmed HID Keyboard (Teensy) attacks, to BadUSB Man In The Middle attacks, to one-click MANA Evil Access Point setups. And yes, NetHunter natively supports wireless 802.11 frame injection with a variety of supported USB NICs. NetHunter is still in its infancy and we are looking forward to seeing this project and community grow.